administrative, training, recruiting and ERP needs. Streamline the qualification process with efficient scheduling arrangements that will save your staff and employees time and hassle. Help your teams stay qualified with notifications and reminders. Get detailed, segmented reports and overviews on qualification status, zooming in on specific employees/staff members. Manage organization-wide permissions based on certifications, making sure all your employees are qualified and prepared at every moment. Blossom makes it possible to gather quantifiable feedback and evaluate your instructors’ professionalism, alongside effectivity of the training. Manage all your training resources meticulously, cut training expenses and get a centralized,comprehensive view into your training budget. Make the most of Blossom’s beautiful, engaging training software to provide an innovative computer-based training experience to your staff and employees. Blossom offers a friendly and helpful platform to digitize your exams, surveys and quizzes. Combine question types to create a broad, challenging evaluation questionnaire. Blossom’s forte in the evaluation arena: automated grading and results analysism that will free your staff to deal with teaching and training. Create advanced feedback surveys and questionnaires for employees, staff and students. Our evaluation software can be connected to your existing organizational systems to create a seamless, hassle-free experience for your users and integrate results in relevant HR or CRM databases. 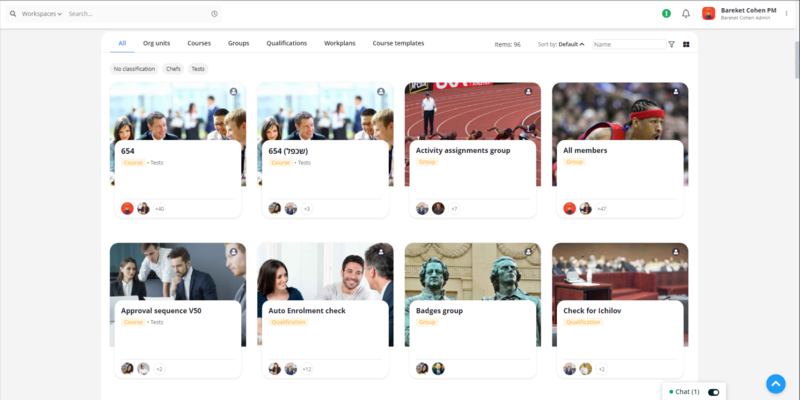 Blossom’s personal information system offers an overview of the user’s status, projects, workplans, courses, tasks, achievements, grades, qualifications and more. Users can easily upload files and update their user information. You can use the information system to present user information by push and keep users updated and informed about their performance in the organization. Blossom’s User/Student Information System module allows you to configure the viewing options so that your users can decide how they want to view their information, but you, their admin, can determine which information they can access. Blossom’s state-of-the-art resource management module combines robust capabilities with a light, friendly user interface. Get an in-depth, fully segmentable view of multiple budgets and make educated budgetary decisions that will impact the entire organization. Plan your spend and resources with reports tailored to your organization’s needs. Eliminate misuse and waste and carry out only the cutbacks your organization absolutely needs. End-to-end project management software, including task management, overview and support that makes it possible to oversee and manage project on any level of the organization, from any angle and position. Make sure your organization stays sharp and dynamic with pre-designed workplans for each department, aligned with the organization’s strategic and fiscal goals. Simplify support management with Blossom’s easy and accessible ticketing system, integrateable with any CRM or other software with our API. Create engaging presentations, documents and templates for your lessons and courses. Use Blossom’s rich text editor and friendly visual interface to produce delightful source materials for your students or users. Upload any file -text, images, video, links- to create lessons and course directories for your students, employees or staff. Blossom allows you to organize your content sensibly, making it possible to later access it quickly and intuitively through search and tags. Share your content with the right users through helpful notifications, sharing and privacy settings. Encourage your staff or students to explore the power of teamwork through Blossom’s friendly version control tool, coupled with our in-app chat feature, allowing users to stay focused on the task at hand at all times. Ignite dicusssions on academic and professional topics in your own personalized forum. Enable your users to integrate social charecteristics into work and study with Blossom’s social sharing feature and rich, beautiful blogging platform. Blossom offers a platform for course management, where assignments can be handed and carried out and essays submitted all online – in Blossom’s friendly and easy to handle digital environment. Blossom’s beautiful, friendly interface makes it easy for teachers, instructors, students and trainees to streamline the entire course plan through the digital environment. Drive your organization to better, data-driven results with Blossom’s panoramic view of insights and analytics, supported by helpful visualizations. Customize your insights exactly the way you want them to reflect work processes, goals and yearly work cycles. Benchmark achievements to help you calculate ROI and make educated decisions. 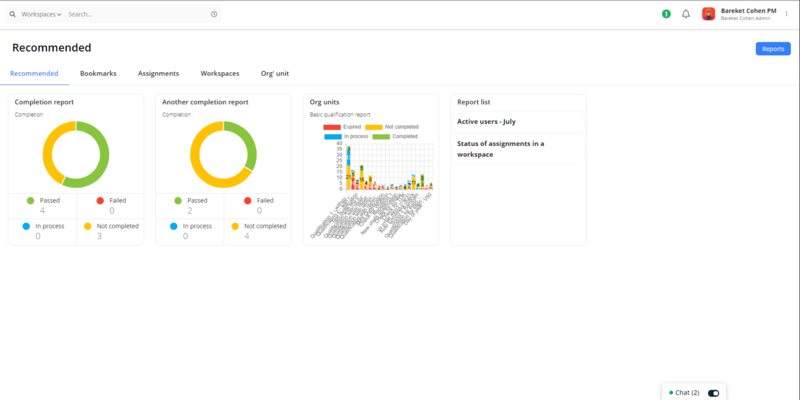 Get full view of your users’ activities on all active Blossom modules, segmented in a variety of different ways and gain a broad picture of your organizational activities. Get in-depth insights into any of your resource pipelines, courses or activities and get a comprehensive picture of your organization’s flows and operations. Blossom’s offers 120 off-the-shelf reports that cover a wide range of organizational needs. We can also help you custom-build reports as per your specific requirements, tailored to your unique work flow and demands. You can schedule reports and send them, directly from the report module, to the people and roles who need to be in the loop. Manage the recruiting process seamlessly, enable HR to create a smooth hiring procedure that will ease the new employees into your organization. Create and manage your staff’s development path and track your team’s life cycle performance to identify bottle necks and challenges in every day routine. Blossom excels in hands-on, innventive technological solutions for our clients. We go out of our way to make sure you get exactly what your organization needs to stay in the forefront of the industry. Blossom’s 12 modules form a holistic management system for organizations. Select the modules you need and we will happily grow with you and provide additional modules as your organization develops and your needs grow. Blossom operates seamlessly on most devices, browsers and operating systems. Do you work with a browser/OS/device we aren’t yet compatible with? Drop us a line, we can discuss customization options. Blossom is installable and accessible on cloud -including your organization’s private cloud- and on premise. Blossom is set up to deal with any connectivity challenges that arise in remote locations. We provide solutions for a variety of technological issues to help run Blossom smoothly, wherever you need it. We work with the Pentagon development methodology, making almost any customization you require easy and fast. Blossom’s unique dynamic API enables easy integration with any other system, through a variety of technological options.